This is a picture of a man sailing over a charging bull, looking much like an Acapulco cliff diver, only sideways. One thing we can say for sure about this guy is that when he landed, it wasn’t in water. Hopefully, it was just sawdust, or sand, or something equally inoffensive. Anyway, it makes for a compelling image, and instantly raises the question: What is this man doing, and where did he get those nifty socks? I’ve had no luck with the socks yet, but it only took a few clicks to learn that the man is called a recortador, a professional bull-leaper. That’s right, he leaps over bulls for a living. The sport is called recortes, and the premise is to avoid being gored and trampled by a stampeding bull while still picking up points for style. To do this, the recortador relies on courage, preternatural agility, and an uncanny knack for knowing where the bull is going to go. The only weapons he takes into the arena are his wits and an unlimited supply of hair product. The modern sport of recortes is known by almost no one. It is practiced mostly in a few areas in northern Spain and isolated parts of France, where it meekly coexists alongside its braggadocian cousin, bull-fighting. Why bull-leaping remains so obscure is a real mystery. Killing a bull with spears and lances is one thing, but to go out there and try to embarrass one to death takes it to a whole new level. Bull-leaping requires no less fortitude on the part of its participants, but it does require a whole lot more athleticism, not to mention flexibility. Don’t believe me? Watch this. The thing is, as obscure as it is today, the sport of bull-leaping actually has roots going all the way back to the ancient Greek world. That’s why the image originally caught my eye. As soon as I saw it, I was reminded of a fresco recovered from the palace of Knossos in Crete. It dates back to 1700-1200 B.C. 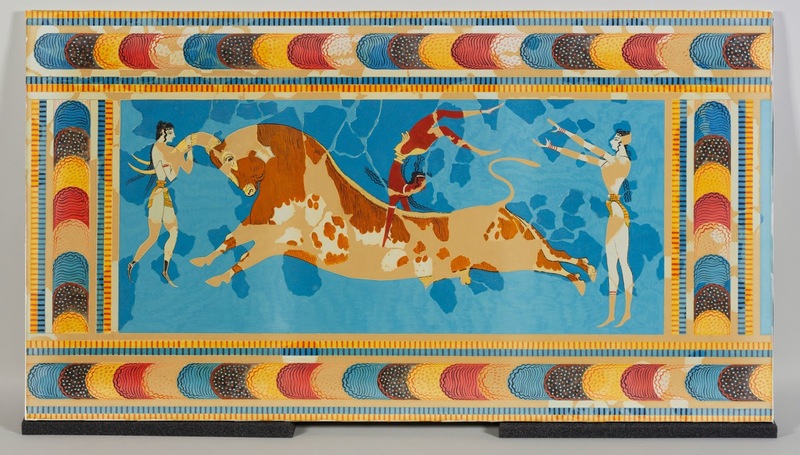 According to the experts, bull-leaping was quite the rage in old, old, old Crete. And the sport wasn’t limited to the relatively simple matter of leaping over the bull, like today’s recortadores do. No, experts seem to think that the ancient Cretans did astonishing acrobatic routines, using a rampaging bull as their apparatus. They theorize that it worked something like this: the bull charged at the target, in accordance with standard bull-charging procedure. Just before impact, however, the person jumped up, grabbing the bull’s horns with both hands. Then, as the bull reflexively threw its head upward, the person was catapulted into the air, where he was free to perform as many flips, twists, Heisman poses, etc., as he could while waiting for gravity to reel him back in. 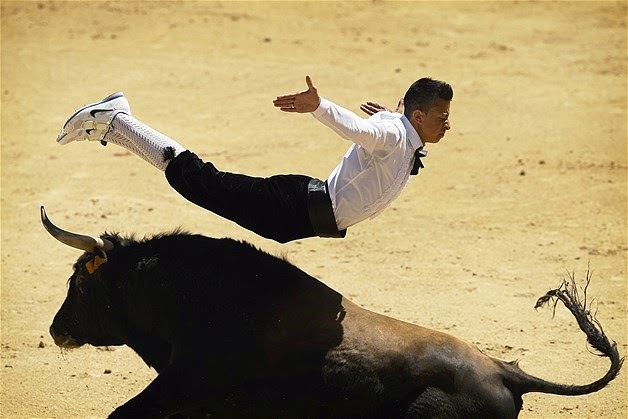 As if that weren’t enough, some further believe that the person would land on the bull’s back, probably so he could mock it with the Cretan equivalent of ‘nanny-nanny-boo-boo’ before dismounting in some equally impressive and death-defying manner. In a way, it sounds similar to the contemporary gymnastic event known as the vault. Of course, no bull is used; the modern athlete utilizes a piece of equipment called a vaulting table. Among the benefits, it's fully padded, and it’s got springs built right in, which provide the gymnast with the necessary boost he or she needs to execute their leaps. Another advantage is that the table stays put. And, oh yeah, the table doesn’t possess an uncontrollable desire to turn every gymnast it sees into a jock-ka-bob. Aside from that, though, the similarities are enough to wonder if perhaps the modern vault originally derived from the bull-based version. 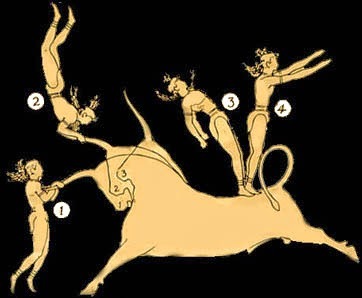 Some argue that the bull-leaping acrobatics ascribed by historians to the ancient Cretans are physically impossible to execute, given the speed involved, the strength required, the trajectory of the bull’s head thrust, etc. Whether this is true or not remains to be seen, as nobody seems to be in a hurry to test the hypothesis. Personally, I think this would make a great experiment for a Mythbusters: Greek Mythbusting show. Other possible topics: Did Hercules really look just like Dwayne Johnson, Was King Midas’ golden touch really golden or a cheap imitation, and How long can thirty Greeks be stuffed into a wooden horse without arguing so loudly they ruin the surprise?